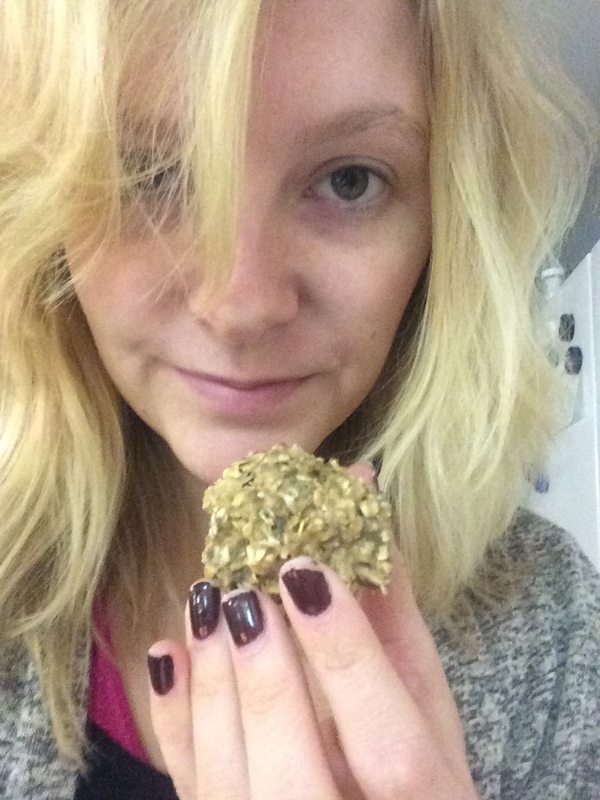 Saturday Morning Protein Balls! – The Small Things. Happy Saturday!! On a normal Saturday Lucas and I would sleep in until about noon and then loaft around until the evening. Yup, we are big fans of relaxing on the weekend, but this weekend is different because Lucas is far away in Northern Ontario visiting a friend. So instead of lazying around I decided today was going to be a day of productivity. So far today I’ve done two loads of laundry, showered, washed the dishes, tidied, vacuumed, cooked soft boiled eggs for breakfast, made protein balls and relaxed with a cup of tea and a book! I’d say thats a pretty productive Saturday morning. 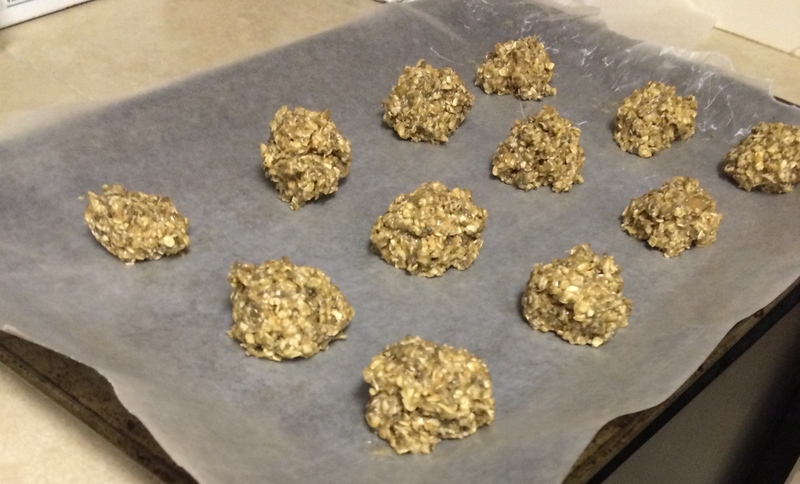 I have been wanting to attempt a protein ball recipe for a while now. Store bought protein bars are not cheap and they are filled with added sugars and things that just aren’t needed. I’ve been scavenging through pinterest to find the perfect recipe but it has been challenging. Most recipes call for super fancy all natural ingredients made by companies who do not distribute to Canada. I’m sure if I did enough research I could find a Canadian replacement but I just couldn’t be bothered. So I continued to search for a protein packed ball recipe that only called for ingredients I had easy access to. This is a body building website dedicated to health and fitness. The recipe was sweet and simple. Exactly what I wanted! And packed with lots of protein goodness! Here is a copy of the recipe I followed with my comments in pink! 2 T protein powder or peanut flour — I used cookie dough flavour protein powder because it was all I had but next time I’ll use a plain chocolate or vanilla. In a bowl, mash up banana with a fork. Add honey and stir well (I used a spatula from here on out), followed by chia seeds and cinnamon. Stir again- mixture should be semi-thick. Stir in peanut butter. Slowly add in oats, stir well. Add in the protein powder 1 tablespoon at a a time and stir. Mixture should start to bind together. Line a small cookie sheet with wax paper. Scoop out a rounded tablespoon and drop onto the wax paper. The mixture will be sticky! You should end up with 12 rounded tablespoon-sized scoops. Note: Place in the freezer for at least 4 hours, and then place in an air-tight container. For best results, store in the freezer. Well there you have it folks! 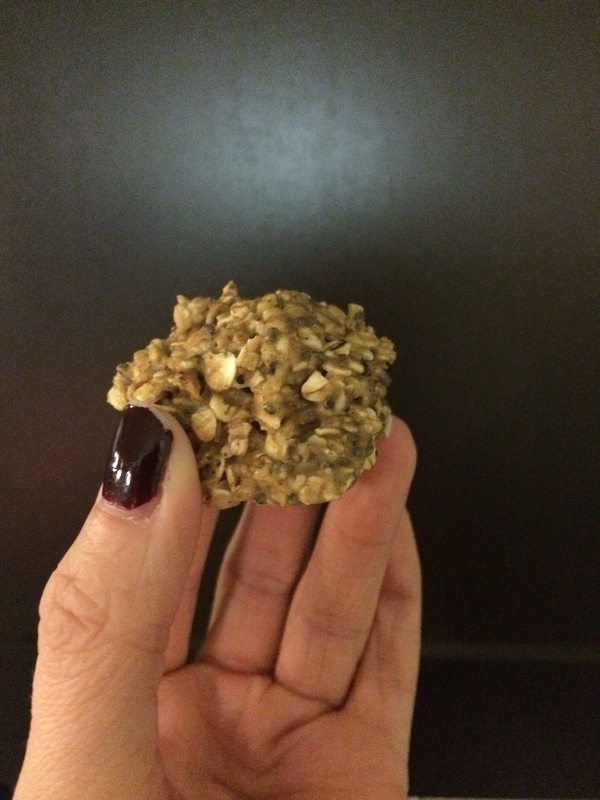 They may not look like much but I think these little balls are delicious and the perfect pre or post workout nibble. Next time I want to try adding raisins and maybe chocolate chips!! What do you get up to on a Saturday morning?! Share in the comments!